Cairo can be an inspiring city, especially in winter. So I think to myself as I come home one evening. The microbus stops where the overpass descends to the street, rain pouring, Road 10 running beneath, the taste of a damp cigarette. Winter is, even so, like religion: both fit spaces for expressing emotion, sadness above all. A whistle lengthening then broken off: a soundtrack to the scene; a perfect summons to tender feeling for a tableau that has been generated thousands of times before and embedded in memory and which, when tickled by the tune, comes back to life. The Law of Inheritance, by Egyptian poet and writer, Yasser Abdellatif, originally published in Arabic in 2002, and now available in Robin Moger’s crystalline translation, is a delicate, filmic ode to emerging adulthood set against the tumultuous political environment of Egypt in the 1990s. Drawing on his own memories and on mythically-toned stories from his Nubian family history, Abdellatif manages to spin, in a mere 94 spare pages, a richly textured tale. The opening section, “Introductions,” sets the stage, sketching in fragmentary, third person passages, images of a young man, at various ages from childhood through adolescence, from grade school to high school, from cigarettes to hashish, to the University of Cairo where both creative and Leftist political energies will be sparked. His father is absent, forced abroad to find work, his mother fragile, and the weight of being the older brother rests uneasily on his small shoulders. This brief, cinematic prelude paints a minimalist portrait of the narrator who will soon step out of the shadows to carry forth his own account, framed within a multi-stranded evocation of contemporary Egyptian identity distilled to its most elegiac essentials. The narrative is moody and melancholic, evocative of time and place, infused with memory and family lore. Architecture and addresses serve as conduits to a personal past—the Lycée the narrator attended as a child, the University of Cairo where he studied Philosophy and finds himself swept up in the fervor of political protests in the early 1990s, the roads and byways where he and his friends lingered, listening to rock and roll and experimenting with pharmaceuticals. One has the sense of a slow, directionless drifting toward adulthood, which echoes and reverberates with stories drawn from his ancestral past and woven into the tapestry of this lyrical novella. As the narrator unspools his tale, he traces his family’s intersection with the city, with its streets and neighbourhoods. Relatives, pushed into exile from their native Nubia, arrive as social outcasts in the early decades of the twentieth century. Some find the promise of a better future; others find it more difficult to adjust. Yet for all of them, even the narrator and his father who are born there, Cairo seems to be a somewhat uneasy fit. His grandfather does well. By virtue of his education, he chances to rise from a barman to an office worker, a transition that affords his family a move up in both social standing and neighbourhood. However, it also loosens the restraints he’d previously maintained against his own religious inclinations, an enthusiasm accompanied by periodic bouts of depression. By contrast, Fathi, a nephew to whom he is very close, has quite a different experience. Given to the pursuit of carnal pleasures, he embarks on an affair with an Italian girl in the mid-1930s. This enrages her budding Fascist countrymen who chase him through the streets and eventually force him into retreat in Rhodes. Another distant relation will fall into religious fanaticism and madness, and will ultimately retreat back to the Nubian countryside. The Law of Inheritance is a novel of exile—from a homeland, a city, a neighbourhood—that succeeds through its lyrical precision and its measured humility. The narrator warns against vanity early on, and he is, in his own transition to adulthood, neither hero or victim. Likewise, the men in his family whose stories are told without glory or pity. The result is a powerful, moving exploration of what it means to belong in a world that is ever shifting and changing shape. 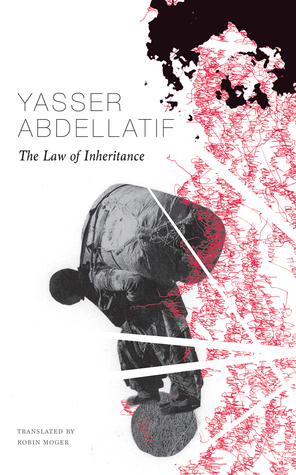 The Law of Inheritance by Yasser Abdellatif is translated by Robin Moger and published by Seagull Books. This sounds interesting. But does he not mention women? Sisters? Girlfriends? It is very spare, poetic and yes, there are women, often quite despairing of their husbands or the situations fate hands them (like his mother who is left to raise the two boys because his father cannot find work at home). And of course the narrator is remembering a time when he is young and, one senses, in awe of women and perhaps somewhat inept. I read this book several weeks before I had time to write about it and found I had to go back and reread several times to capture it. My appreciation for this type of spare work grows through the process of rereading and writing, often lasting long beyond books with a greater immediate impact that quickly fade. Previous Previous post: The never-ending ending: When will this move be over?